Wrangling Email: Avoiding some of the issues raised in "The Shallows"
In the book "The Shallows", the point is well made that the internet, while providing a lot of excellent productivity and social tools is also a "distraction machine". I thought it might be helpful to share some of my experience in reducing these distractions. Many of these practices are the result of over 20 years in using this technology as it has developed to what we have today. These practices arose primarily as a self-defense mechanism as my career has required the use of this "distraction machine", often requiring me to be available 24x7, while remaining productive and sane. Today's focus is on wrangling email under control. This requires first and foremost a level of discipline and commitment to configure your tools to work for you and not the other way around. Unless your job IS email, if you don't think you can realistically go for a couple hours without checking your email, that's where some self-examination may be in order first. Don't have your email application / window / tab be readily visible. It is easier to focus on other things when email isn't even visible. Try to make it take a couple clicks to see it. Block out times in your schedule to specifically deal with email. Don't Let Your Email Interrupt You! Most every email application whether it be web-based (Gmail, Yahoo, etc.) or thick client-based (Outlook, Thunderbird, etc.) or mobile device-based generally provides a feature where new email will generate a noise and / or a pop-up window / box to show you some snippet of new email. Good news is that this isn't standard behavior for web mail, though there are browser plugins that can do this for you. I obviously don't recommend installing them! Outlook, on the other hand is a huge offender in this area. When I used Outlook, this was the first thing I turned off. Mobile email is also a huge distraction, not only during the work day, but during family meals, social engagements in the real world (you remember those?) and of course when you sleep. I recommend turning off the audio / vibration function for incoming email. That incoming email ding at the least drags your attention away from what you are doing, but also then creates this tension to see what you're missing. Back when mobile email was first getting started with the Blackberry, "crackberry addiction" was actually "a thing". Notify for every message = Off. This setting is very handy if you frequently do have situations where you absolutely need to know about that "next message". Turning this = On and picking a sound means that only the "first next message after you've checked your email / cleared your email notifications will chime / beep / whatever. I'm not currently in that situation, so I have mine set to Off for now. 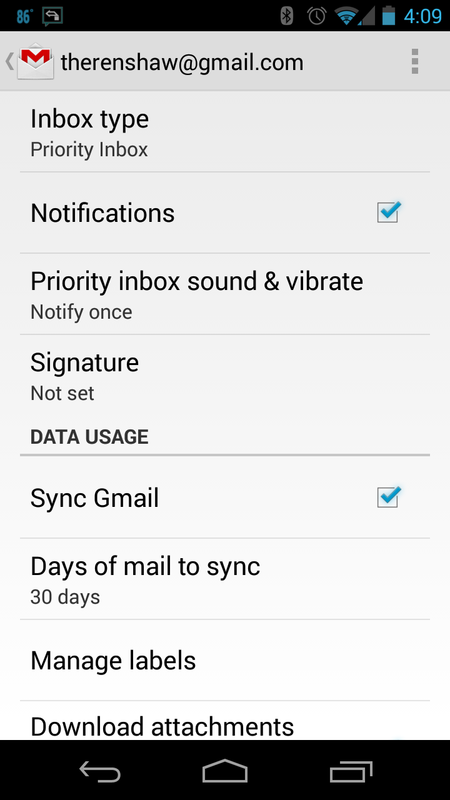 Notifications = On, but then go to "Priority inbox sound & vibrate" on the next screen. Notify for every message = Off. I can't recommend this strongly enough. This will help you put the emails that are actually important at the top of your inbox and filter others lower down. This helps you quickly find those emails you really care about and peruse the newsletters, coupons and other stuff lower in the list.